Being a follower of Malayalam films is an exhilarating, enriching and confusing business these days. The worst of Mollywood rivals the very worst being produced by commercial cinema across Indian industries, especially in terms of misogyny, whereas the best of Malayalam filmmakers are more consistent and prolific than the rest and routinely churn out quality works that are, along with Marathi, the best of India’s best. Walking into a theatre screening a new Malayalam film in 2018 is, therefore, a gamble with potentially vastly unpredictable outcomes. Watching Abrid Shine’s Poomaram (Flowering Tree) this week reminded me of the warmly pleasant wave of surprise that washed over me when I saw Njandukalude Nattil Oridavela last year and Shine’s own Action Hero Biju in 2016: whatever I may have been subconsciously expecting from the film, this certainly was not it. Poomaram is a cinematic enterprise disguised as a reality show. It takes us through the run-up to the Mahatma University Youth Festival in a particular year and the days of the fest itself, the preps, the competitiveness, the institutional and individual dynamics, crushes and awkward courtships, hooliganism and early tests of leadership, performances and final results. The focus remains firmly on the participating teams from Ernakulam’s famed St Treesa’s College – the defending champions – and their arch rivals Maharaja’s College, especially their respective student leaders Irene and Gauthaman. On the face of it, what we get here is an education in Kerala’s rich cultural heritage through contests in various art forms ranging from Kathakali to Mohiniattam, Thiruvathira and more, along with an understanding of the average Malayali student’s exposure to and interest in the arts from other states. The film is also bound to evoke nostalgia for college life among older audiences as we watch the level of commitment towards the festival among these youngsters and the tensions that follow, including between their trainers. In a sense then, Poomaram is a reminder of how every challenge we face appears magnified in the present, and how what was once earth-shattering very often looks mundane in retrospect. There will, of course, be additional layers of meaning for those who know of the real Maharaja’s and Teresa’s traditional rivalry. There is far more to it though. Through the unmelodramatised, unadorned unspooling of events at the festival, Poomaram serves up an unconventional commentary on Kerala society — on gender equations, segregation, caste, class and ideological differences. The most obvious mirror here is the one held up to the larger student body’s reaction to the women of St Treesa’s. I don’t care that we are not winning but I am glad that Treesa’s is at No 3, says a chap at one point. He cites the women’s “attitude” as the reason for his animosity, yet it is hard not to wonder whether it is attitude or the mere fact that they are women that has him bristling, and/or whether he is resentful because they come across as being more sophisticated and urbane in their attire, deportment and language than most of their peers. Poomaram is the sort of content you are likely to get if you were to place cameras for a few days at a university campus, without covertly offering scripts to your subjects (as most TV ‘reality’ shows seem to do) and edit the resultant material down to 2.5 hours. The beauty of this film is the spotlight it places on the pain, hurt, humour and joy contained in everydayness. This is not to say that Poomaram is an entirely smooth ride. Once the initial surprise is over and the fascination with its unusualness is done and dusted, there are patches in the second half that feel stretched and unexciting. Besides, it does not make sense for a film of this nature to build up a single character at the expense of others, but Abrid Shine cannot seem to shake off the awareness that Maharaja’s union honcho Gauthaman is played by Kalidas Jayaram – son of acting veterans Parvathy and Jayaram, and a one-time National Award winner for Best Child Artiste – making his Mollywood debut here as an adult. The marginal though discernable elevation of Gauthaman above Irene from Treesa’s, becomes particularly noticeable because Irene is played by the dynamic newcomer Neeta Pillai. 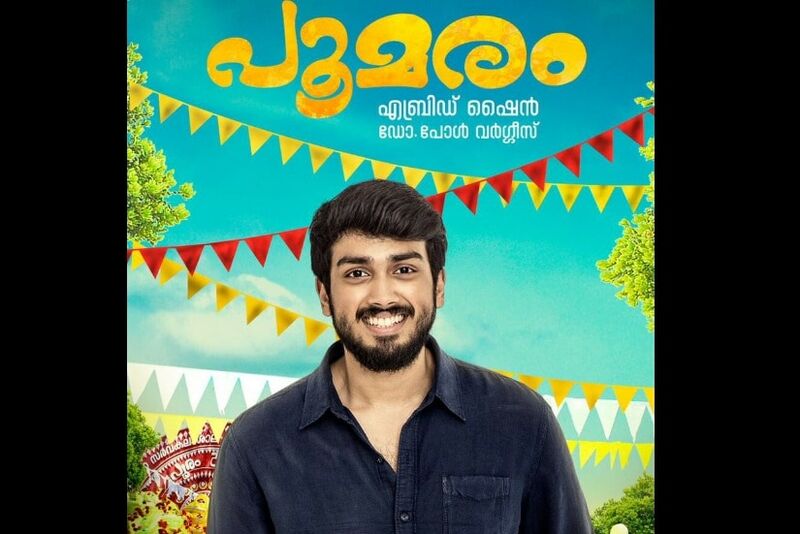 Poomaram’s pre-release media coverage is devoted almost entirely to Jayaram Jr, but I gathered from the Internet with some difficulty that Pillai was the second runner-up at a beauty pageant for south Asians in the US in 2015. She is attractive, charismatic and a natural before the camera, so it beats me why Shine thought it fit to underline Gauthaman’s importance over Irene. We meet his family, not hers. A long song in Poomaram’s opening scenes remains focused on Gauthaman. Midway and in the end too he is the central figure in song sequences, although the latter is filmed among a massive crowd. It is worth mentioning that the duration and picturisation of the first and last among these, and the overtly didactic nature of the climactic number, make them a departure from the tone and apparent intent of the rest of the film. Perhaps this has something to do with the fact that Shine, wonderful filmmaker though he is, tells stories from a male viewpoint untempered by a female gaze. It is as if he cannot help himself. The scenes with Gauthaman’s family, for one, are fixated on his somewhat pompous Dad and sideline his Mum. At no point is this male-centricity more evident than in the closing passage of Poomaram when Shine thinks nothing of allowing a male-led co-ed college to upstage an all-women institution, despite the latter’s remarkable achievements and talent. This is a director with such an uncommon vision that it would be a pity if he never becomes aware of his weakness. Among the cast, Pillai and the young lady playing what appears to be Gauthaman’s second-in-command in Maharaja’s union stand out for their star quality. Kalidas is sweet-looking and likeable, but could do with more spark. The rest of the team is so deliciously believable as students and teachers that they may well have been gathered from actual universities. A special salaam then to Poomaram’s casting department. Among the few established faces on the roster is Joju George who is his usual dependable self in a laugh-out-loud hilarious yet thoughtful sidelight at a police station. Meera Jasmine and Kunchacko Boban make minuscule but memorable guest appearances as themselves. Abrid Shine’s school of filmmaking is one of many notable developments in the middle-of-the-road cinema coming from Mollywood in recent years. Poomaram is a delightfully experimental, contemplative college saga, far removed from the clichés, the ugly misogyny and loudness seen in too many campus films from Mollywood. Its warts notwithstanding, it is like that snuggly blanket you do not want to leave on a cold winter morning, that hot cup of coffee you embrace with both hands when you finally emerge – comforting, familiar, regular yet so special. Shine’s latest work is not just a film. It is an adventure.